Download The Good Lie in Digital HD from the iTunes store. The Good Lie images are © Warner Bros.. All Rights Reserved. "The good lie" is when not telling the truth is for the betterment of others; "the end justifies the means" so to speak. It's a heartfelt a sentiment especially when you know the reason for the lie is ultimately the best choice even though you know it's wrong. The Good Lie, a new film from Warner Bros. illustrates this point accurately and poignantly. 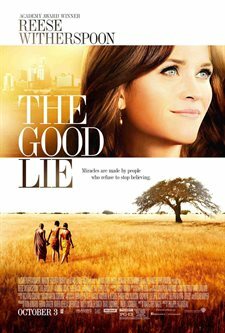 Starring Reese Witherspoon (Legally Blonde, Walk the Line), The Good Lie tells the story of four Sudanese refugee "siblings". Based on a true story, the movie depicts the atrocities of the Sudan war. It details the lives of numerous people left displaced and tens of thousands of children who were orphaned and living in refugee camps. In the beginning of the film, we see soldiers senselessly murder most of a village and the journey the orphaned children take looking for safety and sanctuary. The film then skips ahead 13 years as the Deng children, adults now, make their way to America to start a new life. Of course this "land of opportunity" isn't all they hoped it would be. They are separated from their sister and must navigate a world full of technology that they can barely understand. They try to retain their faith, naiveté and family values as outside pressures of their new home threaten to split them apart. Casting real life refugees and former child soldiers Arnold Oceng (Mamere; My Brother the Devil), Ger Duany (Jeremiah; I Heart Huckabees), Emmanuel Jal (Paul; Africa United), and Kuoth Wiel (Abitol) lent an air of believability to the film that might not otherwise have been achieved. The actors do an admirable job and hold their own next to veteran Witherspoon. The latter actor even noted they gave invaluable input regarding the life and struggles in the refugee camp helping the rest of the cast and crew to try and understand that world. Director Philippe Falardeau (Monsieur Lazhar) infuses majestic African scenery with dangerous scenarios in an attempt to remind us of the horrible events these people endured. His vision for the moral story laid out before us is crystal clear and heart wrenching. His view of America seen though the refugees eyes is unapologetically critical. Because of the subject matter, The Good Lie is both difficult to watch and mesmerizing all at the same time. It's a reality check regarding global issues while putting American materialistic ideals under a microscope. I sat through the entire movie with a lump in my throat - first, because of the hardship the refugees faced and second, because I wanted everything to work out in the end. Sadly, it doesn't all fall into place and while there is a somewhat happy ending, it isn't for all the characters, which literally left me in tears.